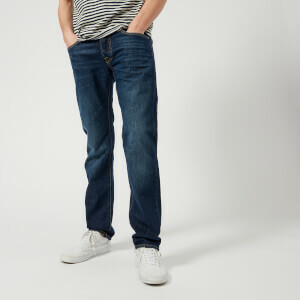 Men's anti-fit jeans from Nudie Jeans. The 'Fearless Freddie' jeans are constructed from 13.5 oz rigid denim and offer a regular, anti-fit with a slim leg opening. The jeans have an authentic wash with slubby, streaky finish characterised by ring spun yarns, and feature a button fly, five pockets and copper trims. Complete with orange threads throughout and a branded leather patch to the rear waistband. Organic cotton.